Thanks to the outreach of 2nd Lt Mark Holub, Senior Member, and Capt. Seth Grenke, Deputy Commander Cadet Programs for the Civil Air Patrol’s 391st Composite Squadron , Cadets and Seniors were treated to an extensive tour of Flight Safety-Dallas. The company, located just East of DFW Airport has over 24 pilot training simulators under one roof and the only EC135P2+ Eurocopter flight simulator in the World. engine manufacturer Pratt & Whitney sends its’ newly hired mechanics to Flight Safety for training. Then, the moment we were all waiting for! Seniors and Cadets were invited to try their flying skills with the twin engine Eurocopter EC135P2+ flight simulator. From take off to landing, in good weather and bad, the “copter” was yours to fly. It was simply a fantastic experience! Normally it takes about 18 months to build and completely develop and certify a conventional aircraft simulator. Flight Safety spent over two years developing the computer programs necessary to create all of the flight and weather scenarios needed to obtain a FAA level 3 certification. 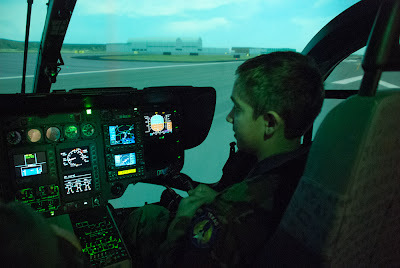 This means that the EC135 Eurocopter training is thorough enough to enable a student to complete the simulator course and with no actual flight time in the helicopter, step into the cockpit and safely fly “the real thing”. Our thanks to Daniel Maclellan, Flight Safety Dallas Center Manager, Assistant Center Manager Paul Kutcha, Flight instructor John Healy and P&W Engine instructor Wayne Russell for by far, the Squadron’s most interesting and thought provoking “Fun Day”.